Ferdinand III (13 July 1608 – 2 April 1657) was Holy Roman Emperor from 15 February 1637 until his death, as well as King of Hungary and Croatia, King of Bohemia and Archduke of Austria. Ferdinand was born in Graz, the eldest son of Emperor Ferdinand II of Habsburg and his first wife, Maria Anna of Bavaria. Educated by the Jesuits, he became King of Hungary in 1625, King of Bohemia in 1627 and Archduke of Austria in 1621. In 1627 Ferdinand enhanced his authority and set an important legal and military precedent by issuing a Revised Land Ordinance that deprived the Bohemian estates of their right to raise soldiers, reserving this power solely for the monarch. Following the death of Wallenstein (who had previously denied him the overall military command of the Catholic side) in 1634, he was made titular head of the Imperial Army in the Thirty Years' War, and later that year joined with his cousin, the Cardinal-Infante Ferdinand, being nominally responsible of the capture of Donauwörth and Regensburg, and of defeat of the Swedes at the Battle of Nördlingen. Leader of the peace party at court, he helped negotiate the Peace of Prague with the Protestant states, especially Saxony in 1635. Having been elected King of the Romans in 1636, he succeeded his father as Holy Roman Emperor in 1637. He hoped to be able to make peace soon with France and Sweden, but the war dragged on for another 11 years, finally coming to an end with the Peace of Westphalia (Treaty of Münster with France, Treaty of Osnabrück with Sweden) in 1648, both negotiated by his envoy Maximilian von und zu Trauttmansdorff, a diplomat who had been made a count in 1623 by his father Ferdinand II. During the last period of the war, in 1644 Ferdinand III gave to all rulers of German states the right to conduct their own foreign policy (ius belli ac pacis). This way the emperor was trying to gain more allies in the negotiations with France and Sweden. This very edict contributed to the gradual erosion of the imperial authority in the Holy Roman Empire. Maria Anna "Mariana", Archduchess of Austria (22 December 1634 – 16 May 1696). 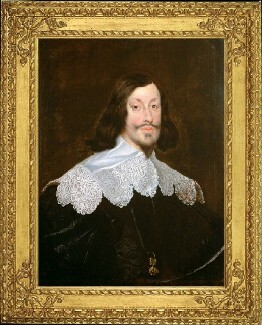 Married her maternal uncle Philip IV of Spain. Eleonora Maria of Austria (21 May 1653 – 17 December 1697), who married first Michael Korybut Wi?niowiecki, King of Poland, and then Charles Léopold, Duke of Lorraine. Maria Anna Josepha of Austria (30 December 1654 – 4 April 1689), who married Johann Wilhelm, Elector Palatine. Ferdinand III was a well-known patron of music and a composer. He studied music under Giovanni Valentini, who bequeathed his musical works to him, and had close ties with Johann Jakob Froberger, one of the most important keyboard composers of the 17th century. Froberger lamented the emperor's death and dedicated to him one of his most celebrated works, Lamentation faite sur la mort très douloureuse de Sa Majesté Impériale, Ferdinand le troisième; a tombeau for Ferdinand III's death was composed by the renowned violinist Johann Heinrich Schmelzer. Some of Ferdinand's own compositions survive in manuscripts: masses, motets, hymns and other sacred music, as well as a few secular pieces. His Drama musicum was praised by Athanasius Kircher, and the extant works, although clearly influenced by Valentini, show a composer with an individual style and a solid technique. 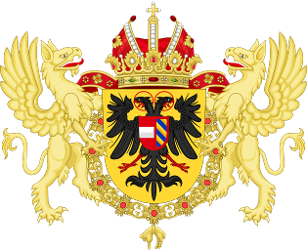 Ferdinand III, by the grace of God elected Holy Roman Emperor, forever August, King of Germany, King of Hungary, Bohemia, Dalmatia, Croatia, Slavonia, Rama, Serbia, Galicia, Lodomeria, Cumania and Bulgaria, Archduke of Austria, Duke of Burgundy, Brabant, Styria, Carinthia, Carniola, Margrave of Moravia, Duke of Luxemburg, of the Higher and Lower Silesia, of Württemberg and Teck, Prince of Swabia, Count of Habsburg, Tyrol, Kyburg and Goritia, Marquess of the Holy Roman Empire, Burgovia, the Higher and Lower Lusace, Lord of the Marquisate of Slavonia, of Port Naon and Salines, etc. etc.